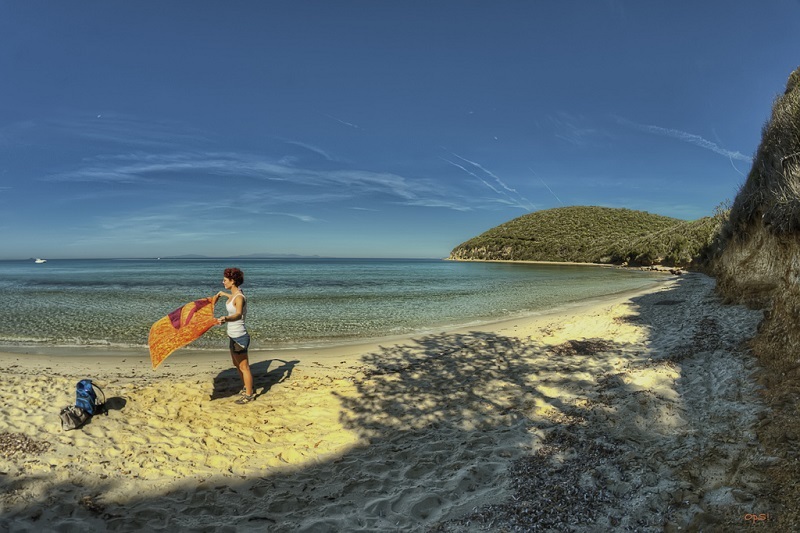 Description of the best Tuscan beaches may be very extensive, therefore UnseenTuscany.com presents you a list of the top beaches, awarded the ‘Bandiera Blu’ (English: the Blue Flag). Usually each year there are about 15-20 beaches in Tuscany marked with this sign. What does it mean ‘Bandiera Blu’? It is an official sign of beach recognition, a mark of its quality, used in 60 countries all around the world. Beaches marked by the Blue Flag are rated according to the quality of their shore and water, parking places, bars and restaurants nearby, toilets, showers and etc. However, even if the beach does not have ‘Bandiera Blu’, it does not mean that it is inappropriate or dangerous! 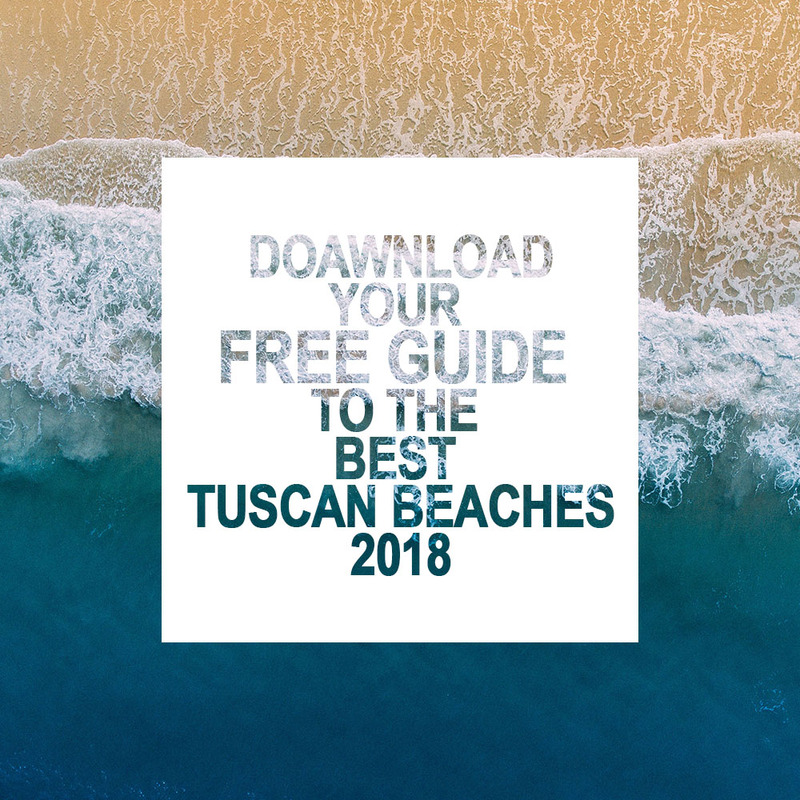 So here are the best Tuscan beaches for your attention, but don’t miss out our Blue Flag beaches in Tuscany for 2018 and our foldable free guide to the Best Tuscan beaches 2018!!! Riviera Apuana and Lunigiana – is a northernmost coastal zone. 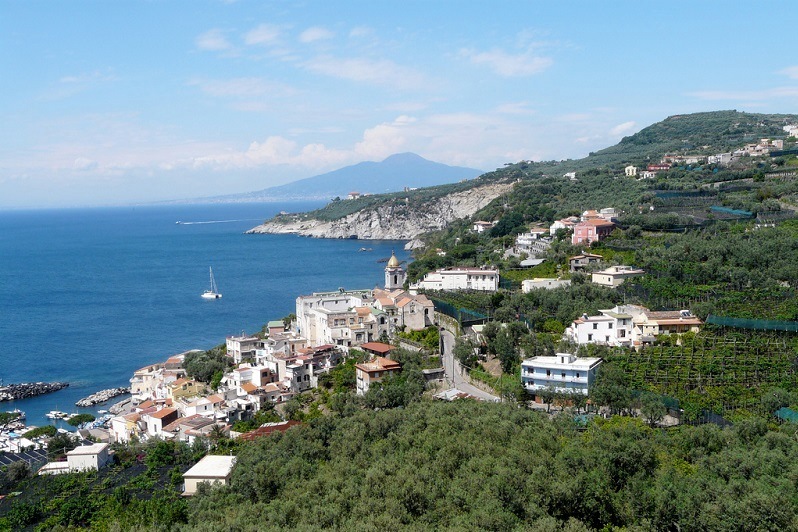 This Tuscan coastline is very diverse and rich in beautiful landscapes: high rocky and white marble mountains that descend almost to the sea, warm waves of the Mediterranean, small ancient villages, medieval castles, crooked secluded churches. It is a place where legends intertwine with reality and take travellers to a coastal tip, savouring of the extraordinary atmosphere. Riviera Apuana and Lunigiana can be visited not only in summer, when the blue sea is most attractive, but also at other times of year – you can choose mountain tourism or get acquainted with cultural, architectural and culinary heritage. It is necessary to visit the impressive marble quarries! Versilia is extended between the Alpi Apuane Mountains, the Mediterranean Sea and Massaciuccoli Lake. This is one of the best and most popular places to relax by the sea in Tuscany – even 270 sunny days per year, the average summer temperature is 24,5 ° C and 9,4 ° C in winter, so in summer there is no devastating heat and in winter it is not too cold. 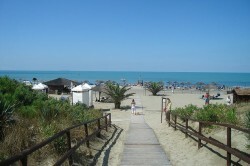 There are many different types of hotels, holiday homes and camps in the area of Versilia. This region is active all year round, so it is possible to find a place to stay even in late autumn. 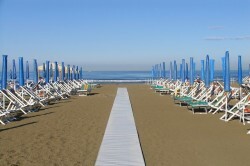 Versilia is famous for its wonderful long beach with yellow soft sand and active nightlife. It is often possible to meet here Italian elite and TV stars. 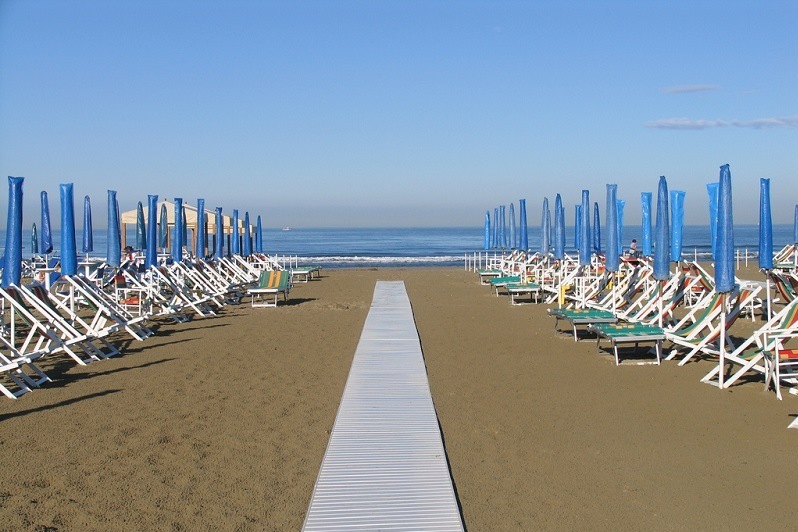 The beaches of Versilia are long and wide, one of them even connects the Forte dei Marmi and Viareggio. The water in the Versilia area is clean, but strong currents that are sometimes felt here make the water look roily. Forte dei Marmi and Lido di Camaiore are the most popular areas with free beaches, where you can find well-equipped recreation zones. Those, who are looking for free beaches, should go to Pietrasanta, which has a wide seaside with enough space for umbrella and towel. The area of Pisa is rich in artistic monuments and beautiful nature, attracting tourists from all over the world. Valdera hills are the birthplace for wine and oil and in the vicinity of the Mediterranean Sea there are the cities of Pisa and Lucca. The beaches in this area are slightly different than in Versilia in the north – here they are surrounded by pine forests. The beaches near Pisa tend to have strong underwater currents. However, the place is well protected – there are several beaches for families with young children that are equipped with rocky barriers, which save the beaches from the open sea. The Etruscan Coast is one of the most interesting seaside zones in Tuscany. There are many traces of Etruscan heritage, transparent sea, ancient villages located on hills, natural parks, one of the world’s most famous wines and delicious seafood cuisine. Costa degli Etruschi is crossed by one of the most famous Tuscan cultural-gastronomic road ‘Strada del vino’. In summer many cultural events take place here – from classical concerts in the open-air to the night of museums and parties on white beaches. 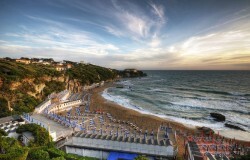 The Etruscan Coast includes several most famous Tuscan beaches. Going from Antignano towards Rosignano, travellers are surprised by splendid scenery – the road here winds across rocky coastal downhill. Many local Italians come here for sunbathing on the rocks in summer. If you also want to try it – do not forget your slippers! Other beaches in the area are covered with larger pebbles and surrounded by pine forests; there are a number of free beaches, as well as beaches for visitors with pets. 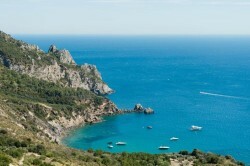 Maremma is considered as the largest coastal territory in Tuscany, extending in the south of this Italian region. From Capalbio, dotted with rocks and green forests, from Italian favourite Follonica to Argentario and its Spanish fortresses and Castiglione della Pescaia, which is the best place to enjoy dolce vita, such a sweet life – Maremma is truly a remarkable land. You can still continue to explore the mysterious Etruscans, villages hidden in hills, and perhaps to enjoy the wild nature of Parco della Maremma. The lovers of good food will not be disappointed as well- every day fishermen going to the sea ensure that in the evening beach restaurants’ tables are spread with fresh food of high quality. And finally – there are beautiful beaches. 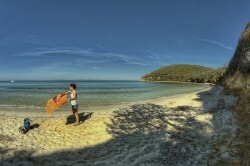 Maremma area includes many free beaches – both paved with fine light sand and quite rocky. One of the best places for families is Marina di Alberese, though it is usually crowded enough, the coast is nice and wide, having pine trees nearby. Those, who wish to find a more remote beach, should walk for about 15 minutes through the grove to the beach of Cala Violina, located to the north of Castiglione della Pescaia. Parking may be difficult what concerns the most popular beaches, it is paid and ‘illegal’ parking is punished by a fine of €35. Sunscreen (€5-12), beach towels (€10) and umbrella (€10-15), diving mask (€5), slippers (€5-15), can be purchased in kiosks located near beaches. Free beaches are not equipped with fresh water showers and toilets (you can use toilet in bars nearby buying there a cup of espresso or a bottle of water). In paid beaches a pair of beach chairs and umbrella will cost you from €15 to €30 per day. Here you will also find changing rooms, showers, toilets, cafeterias. The Mediterranean Sea (unlike the Adriatic) is deepening rapidly, so be careful.